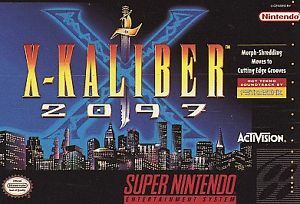 X-Kaliber 2097 for Super Nintendo allows you to take control of Slash as he uses his mystical sword, X-KALIBER, to battle level after level of foot soldiers, shape shifters, and Cyberdynes. When you have rescued Alix, challenge your friends to one-on-one fight. No matter how you play, the soundtrack by Psykosonik punctuates the action on the screen.